Today, my painting 'Half and Half' (which is on display at present at the New Dowse, New Zealand, as part of the 2010 Wallace Art Awards) is featured in John Seed's Huffington Post Blog, 'Five Paintings, Five Palettes: F. Scott Hess, Peter Zokosky, Sarah McKenzie, Nathan Oliveira, Matt Couper'. 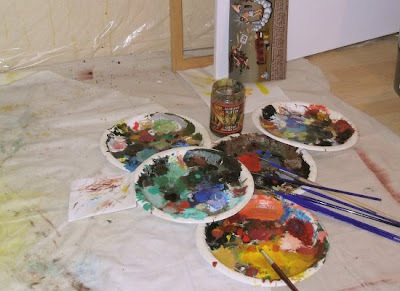 The main idea of the blog is to compare and contrast artist's palettes. So far, mine is the skankiest, with paper plates sitting on the ground with a mess of brushes.